• Get the latest on the project schedule and work hours. Fremont Universe has information about the proposed new building at N 34th and Troll Ave. here: http://www.fremontuniverse.com/2015/02/24/psbj-features-latest-fremont-development-project/ For those who love History House and Cafe Turko, FNC has been told they will be in new spaces somewhere in Fremont. 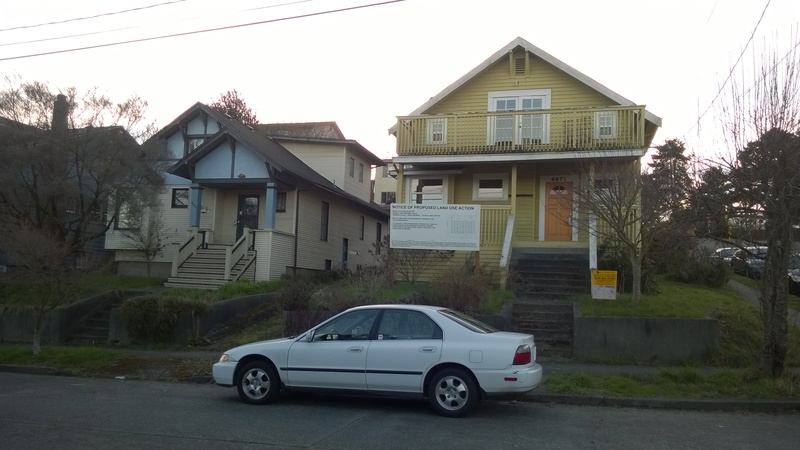 More houses going away in Fremont–see photo above–at 4467 and 4471 Whitman Ave N., to be replaced by 8 townhouses fronting on N 45th. Both were built in 1911 according to property records. Green Canopy, developer, will provide 6 parking spaces though none are required, and has met with neighbors about the planned construction.